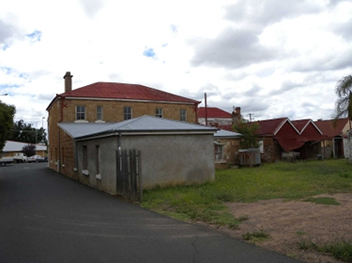 This is a case study of a planning appeal in the Queensland Planning and Environment Court concerning the protection of two cultural heritage listed buildings known as "Plumb's Chambers" located at 82 and 84 Fitzroy Street, Warwick. A satellite image of the location of the buildings is available here. 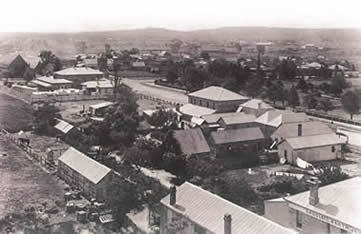 Plumb's Chambers comprise a brick and timber building possibly dating to the 1860s and an 1874-75 stone building. 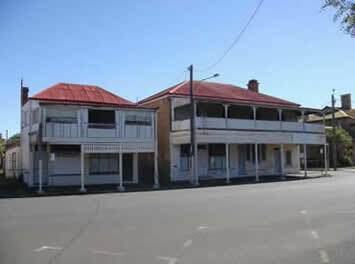 The buildings were listed on the Queensland Heritage Register in 1997 under the Queensland Heritage Act 1992 (Qld) because of, amongst other things, their importance in illustrating the transformation of Warwick in the late 1860s and 1870s from a squatters' town to the principal urban centre of Queensland's most prosperous pastoral and agricultural district. A certified copy of the listing is available here. Development in Warwick, including for Plumb's Chambers, is subject to the Warwick Shire Planning Scheme 1999 prepared under the Integrated Planning Act 1997 (Qld) (IPA) (now replaced by the Sustainable Planning Act 2009 (Qld)). In September 2007 the owner of an adjoining shopping centre applied under the IPA to demolish 82 Fitzroy Street and part of 84 Fitzroy Street (the rear service wing) to allow the extension of the shopping centre (the demolition application). In October 2007 the owner of the adjoining shopping centre applied under the IPA for a MCU over land including 82 and 84 Fitzroy Street, to extend the shopping centre and demolish 82 and part of 84 Fitzroy Street (the MCU application). However, this application was amended in 2009 to limit it to the MCU component of the development. The building at 84 Fitzroy Street was included in a list of local heritage places protected under the planning scheme but, due reportedly to an inadvertant mistake by the local government, the building at 82 Fitzroy Street was not listed. This meant that under the planning scheme the demolition of 82 Fitzroy Street was code assessable while the demolition of 84 Fitzroy Street was impact assessable. Under the planning scheme a material change of use (MCU) for a shopping centre over 4,000 square meters is impact assessable but the MCU application never proceeded to public notification and has now lapsed. The demolition application was publicly advertised as required under the IPA. Several objections were made based on the loss of cultural heritage. The demolition application and the MCU applications were also referred to the then Environmental Protection Agency (EPA) (now DERM) as a concurrence agency under the IPA in relation to development involving a property listed on the Queensland Heritage Register. The EPA initially refused the demolition application but later issued an amended concurrence agency response approving the demolition. Following the EPA's amended response, the local government and assessment manager, Southern Downs Regional Council, approved the demolition. No decision was made on the MCU application and it subsequently lapsed due to a failure to respond to an information request. Two of the objectors appealed the approval of the demolition application to the Planning and Environment Court. the appeal could only validly be made about the impact assessable component of the demolition application (that is, the demolition of the rear service wing of 84 Fitzroy Street). An application for leave to appeal against this prelimanary decision to the Court of Appeal was lodged but it was discontinued prior to a decision being made on it. The parties continued to dispute preliminary issues. A subsequent (second) preliminary hearing determined that the submitter/appellants could challenge the assessment made by the EPA under the Queensland Heritage Act. "The difficulty [with allowing the demolition of the rear of 84 Fitzroy Street] is the planning scheme’s requirement that the heritage place be preserved, meaning (in my view) the whole of it. The loss of a part which is not under threat as the price of the second co-respondent’s taking as yet undefined steps to save and restore the greater, more important parts of the building (whose future use, if any is unknown) should not, as the proceeding stands, be allowed. The link between removing what is to go and protecting what is to be retained is the private owner’s interests, as it sees them, presumably financial/economic interests. Physically, the task of saving what is proposed to remain in no way depends upon demolition or is facilitated by demolition of a structure (the service wing) with heritage value – and which presently makes an important contribution to the whole. It is not shown that the demolition of the service wing and/or the creation of open space in its place advances any public interest or even on its own enhances or benefits the structure remaining from any point of view. I am unable to detect any basis on which the “deal” achieved by the respondent and co-respondents, commendable as it may be, and as much as it advances an important public heritage interest, can be supported in terms of the planning scheme and s 3.5.14(2)(b) [of the Integrated Planning Act 1997 (Qld)]. More would be needed by way of countervailing benefiting of the public interest to overcome conflict with the planning scheme. That might have been available had more been revealed of public interests to be advanced in respect of no. 84 Fitzroy Street from the desired demolition (no particular reason for which emerges) and/or from whatever will be done to what remains." [Note: the MCU application was never publicly advertised and has now lapsed due to a failure to respond to the information request within one year]. Decision allowing the appeal and dismissing the development application: Barnes & Anor v Southern Downs Regional Council & Ors (No 2)  QPEC 119 (Robin QC DCJ). Following the court case the proponent continued to seek approval for the shopping centre expansion over the heritage-listed buildings. 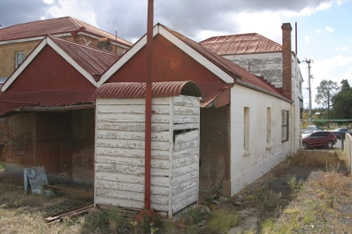 A new application to demolish 82 Fitzroy Street was lodged in mid-2012 and the Queensland Department of Environment and Heritage Protection approved the application. 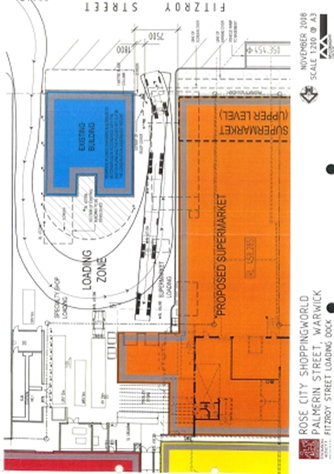 Plan of proposed demolition of Plumb's Chambers to facilitate the extension of the adjacent shopping centre (shown in orange). The part of 84 Fitzroy Street proposed to be retained is shown in blue.